My husband and I met as assigned physics lab partners his last semester of undergraduate college in Wisconsin in 2010. We chatted during the year and both liked each other, but neither of us knew it until Matt finally asked me out the very last day of the semester (thankfully!). We moved in together almost immediately after dating; everything just felt right from the beginning. I started with a drawer in his dresser after a week of dating, he got me an entire dresser of my own in two weeks, then finally I moved in for good. I just never wanted to leave and he didn’t want me to either. We celebrate the yearly anniversary of our first date on February 5th every year. Matt would get me a special surprise or plan a special day for our month anniversary every 5th of the month. We stayed in Wisconsin for the first year of our relationship, with the last six months working at the same company and living in a new apartment together before deciding to move to Florida to prepare for medical school. My entire family is from Poland, so we decided to apply to medical school in my hometown of Poznan, Poland. After my interview in Poland, I returned to Florida (we’d been dating for two years by this time). It was April 4th when I got the news that I would be accepted, and the next day would change my life even more because on the 5th of April, exactly two years and a month after our first date, Matt planned an entire day for the proposal. The day started with breakfast in bed and a special note just to me (1 of 10 notes he made to look like an old scroll, each containing a sweet memory or nice words about me). The second surprise was to take our dog to the park, as Matt knew I had missed him after being away in Poland for two weeks. After that was a surprise trip to the nail salon for a manicure. This was followed by a dress he got for me specifically for this day. I then was taken to our favorite restaurant in town. I thought that the evening was coming to a close. Finally came the biggest surprise of all. He blindfolded me and brought me outside, now at nighttime. There in the courtyard were three floating lanterns. He was down on one knee with the ring in his hand and a note that he read aloud to me. I immediately said yes! I was so happy, crying and nervous that I had to have him read me the note again, because I could barely hear his words over my own heartbeat. We lit two more lanterns as wishes for each other and our life together. I couldn’t have asked for a more romantic and beautiful day. 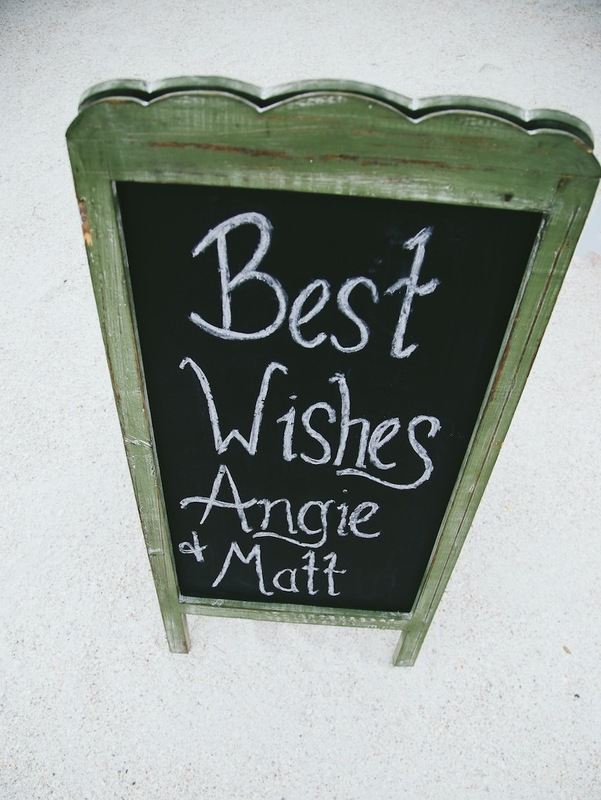 Since the groom’s family currently lives in Florida, Angie and Matt decided to have a destination wedding in St. Pete Beach, Fl. 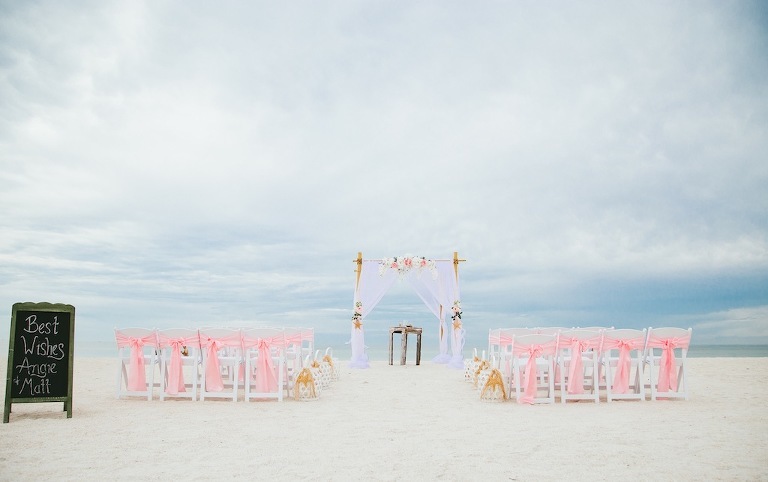 The couples’ love for the outdoors influenced their elegant pink and white beach-themed wedding. 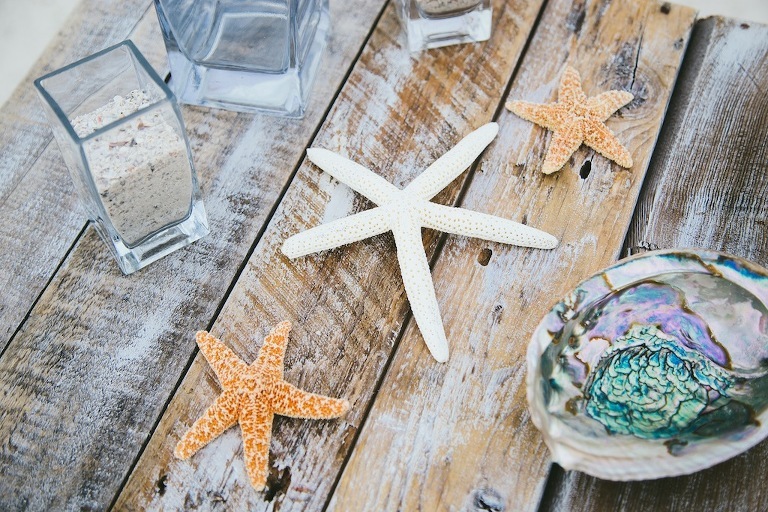 With the pair living in Europe, they knew a wedding planner would be essential for planning their Florida destination wedding. Looking back, Angie shared that one of her most memorable moments was during the wedding ceremony. 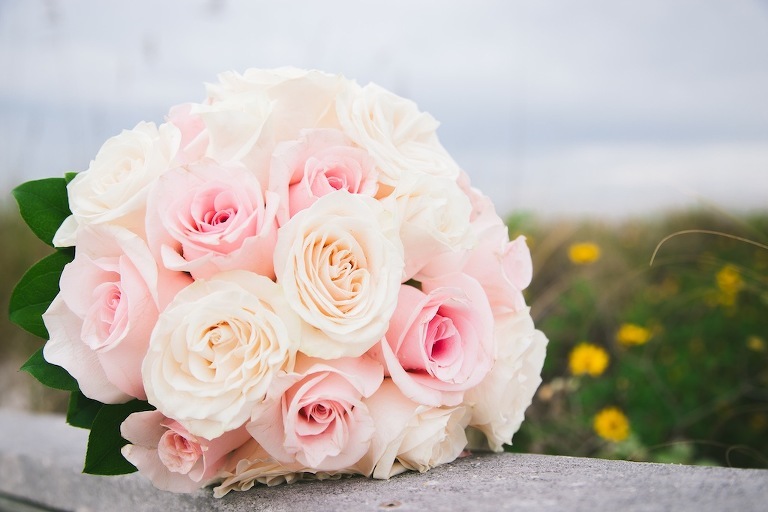 If you find the right wedding planner it makes most of the wedding planning so much easier and carefree. 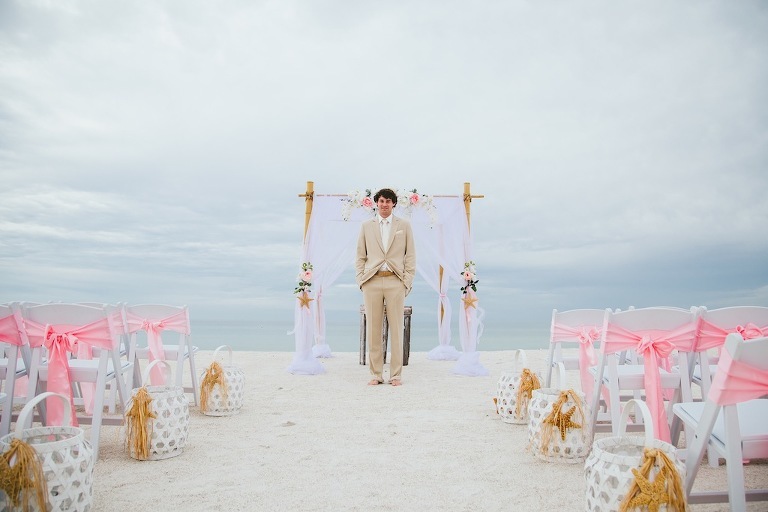 Tide the Knot was amazing if you’d like a beach wedding! Also Camposecco Artistry did a fantastic job with my hair and make-up (the thing I was most particular and nervous about), Donna was amazing.